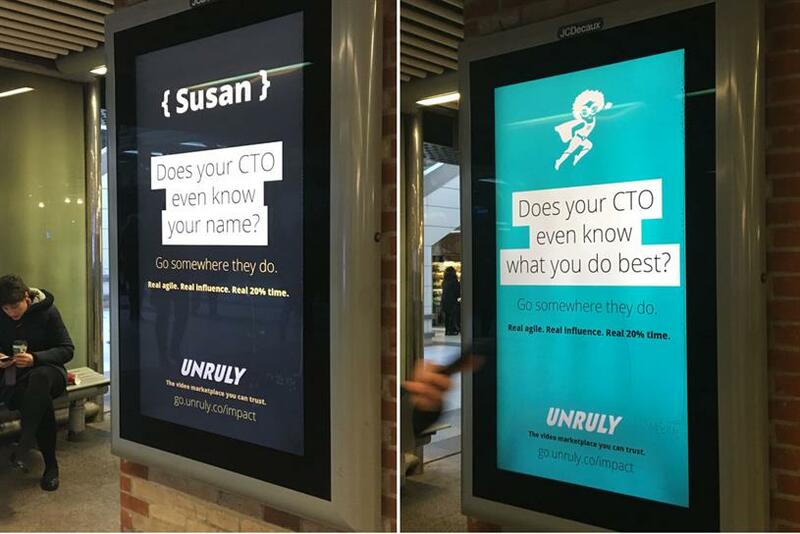 Unruly has placed 29 outdoor ads that are designed to attract developers to join the rapidly-expanding ad tech company. The ads are placed in main stations across London, including Kings Cross and Liverpool Street, and near some of the big tech companies’ offices around the capital. The campaign posters pose a series of questions for any developers walking past, querying whether working for such large companies means their CTOs even know who they are. Questions include: "Does Your CTO Even Know Your Name? ", "Does Your CTO Even Know What You Do Best? ", and "Does Your CTO Know What Drives You?". Some of the questions are directed at specific names – both female and male. "With this campaign, we wanted to speak to both female and male developers who want to work somewhere where their voice can be heard and they can make a real impact," Unruly interim chief marketing officer, Diane Perlman, said. "It’s a well-known fact that gender diversity and inclusion across the tech industry isn’t what is should be. Only 14% of computer science graduates and 17% of professional software developers in the UK are women." Perlman added that the campaign was also designed to be "slightly quirky and hard-hitting" to motivate developers to consider Unruly over larger tech companies. This recruitment drive is to support Unruly's new programmatic drive and products that include verified marketplace. Recently, Unruly hired Paul Gubbins from Oath as its UK programmatic lead. "Developers are the lifeblood of a successful tech company. Unruly is growing rapidly, and to help support our incredible growth we need access to the top tech talent," Unruly chief technical officer, Steve Hayes, said promising a "supportive, fun and agile culture for developers".